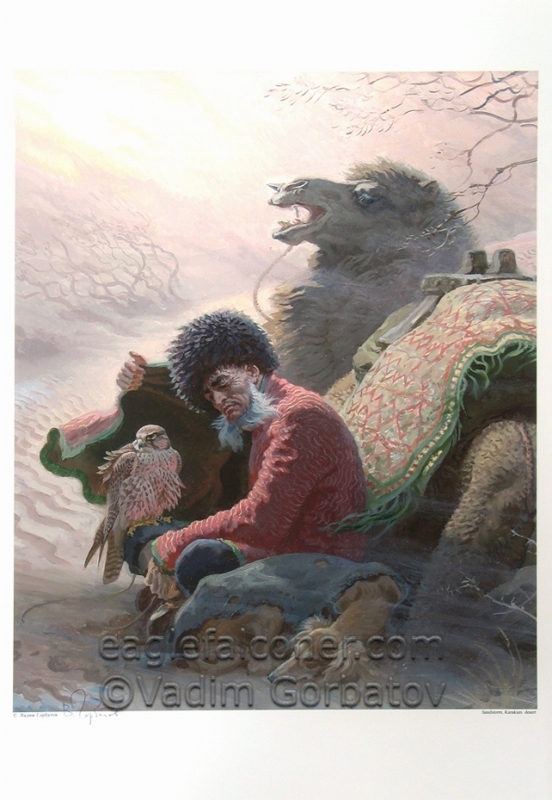 Eaglefalconer.com Vadim Gorbatov Gallery Page. The Karakum desert is largely covered with bushes with a few oasis's. The Karakum or 'Black' Desert occupies an area of about 35 million ha, or more than 80% of the whole territory of Turkmenistan. Getting caught out in a Sandstorm can be serious if not familiar with the desert. The only option is to “sit it out” and Vadim has dramatically painted an image which is one of my favourites. The Turkmenian falconers is shielding his Saker Falcon whilst his faithful Tazy hunting dog curls up close to form her own shelter. The Camel, sometimes known as “the ship of the desert” offers shelter to the group. You can almost feel the sting of the blown sand, it is cold as there are some snow patches in the shadows. Signed print - A4 size at £15.00 + postage. Signed print - A3 size at £25.00 + postage.